As skin ages, cell renewal decreases dramatically, so skin looks dry and dull. Age Perfect Cell Renewal Day Cream SPF 15 speeds surface skin cell renewal, revealing millions of new skin cells each day for fresher, more youthful looking skin. Instantly, skin feels smoother, more supple. In 1 month, skin appears renewed, vibrant and full of life. 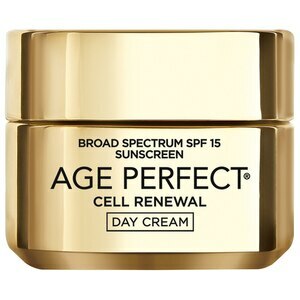 L'Oreal Paris Age Perfect Cell Renewal* Day Cream SPF 15. Every morning, smooth over your face in an upward motion until thoroughly absorbed. For best results, first apply Age Perfect Eye Renewal and Age Perfect Cell Renewal Golden Serum. In the evening, apply Age Perfect Cell Renewal Night Cream.